Whether you are a Product Marketer, a retail Systems Integrator, a Creative Director or an Event Marketer, Magic Matters !! especially when telling a story. Whether you are telling a story to students in your classroom, or about your product in a busy exhibition hall, if you need to engage your audience, you need to grab and hold their attention. Realfiction with its Holographic Displays, will serve those companies who serve brand owners in shops, malls, lobbies and exhibition halls. Anywhere a creative story needs to be noticed and needs to make a product remarkable. 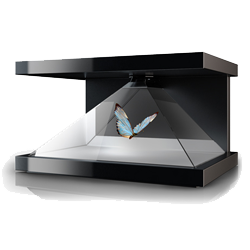 A 3D holographic display packed with features to bring your client’s products to life. Enveloping your client’s physical product in a magical 3D holographic story of your imagination helps them to connect emotionally with their audience, and differentiate their brand message. Encased in a portable, reliable Plug & Play display case is the key to building a scalable and successful campaign. LightControl is just one of the unique features used in the Dreamoc 3D Holographic display to bring your story to life. Take a look for yourself, and sign up for our regular newsletter with case studies and details of how our featured partners delight their clients globally.